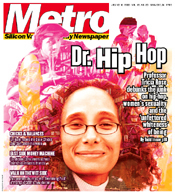 Professor Tricia Rose debunks the junk on hip-hop, women's sexuality and the 'unfettered whiteness' of being. The Greenbelt Alliance's utopian plan for Coyote Valley--where gentleman farmers can mingle with urbanites in a brand-new community of 80,000--has left environmentalists wondering whose side they're on. Public Eye: Money for Something. Biter: Whatever happened to the sugar-smacked-up mascots of yesteryear? Notes From the Underbelly: Cadillac Margaritas. Techsploits: The Mysteries of Theo. Water World: François Ozon's 'Swimming Pool' pits a reserved older woman against a promiscuous playgirl. Drag City: Set in 1930s Rio de Janeiro, 'Madame Sata' portrays one transvestite's grit and glitter. Tiffany Talent: George Axelrod (1922-2003): It was good to know he was out there, taking it easy for all the rest of us. Whistlin' Dixie: Who knew the world's most controversial band would be three gals from Texas? Disconnected: Former Weezer bassist Matt Sharp pulls a reverse 'Beverly Hillbillies' and rediscovers his creative essence. Aural Fixation: Poison's big return to the Bay Area was marred by a low turnout. Metro's Club of the Week: Music After Dark. Arcadian Rhythms: The boldly named new dining room attached to San Jose's convention center works for its pricey reputation.